In case of loss of GPS: how can an aircraft not only be navigated but navigated so precisely that it can pinpoint its destination airport ? The question you should be asking is rather, how did airliners navigate before the widespread adoption of satellite-based navigation systems such as civilian GPS? One can navigate by way of landmarks (as is typical in low-altitude VFR general aviation), but more typical in commercial aviation in the absence of GPS would probably be to navigate by either inertial navigation, or by radio beacons. There are or have recently been several systems that can be lumped together as "radio beacons", such as for example NDB, VOR/DME and ILS, which are used for different purposes, and have different strengths and weaknesses. Until recently, another such system was LORAN. Major airports typically offer a number of radio beacons that can be used for locating the airport, and there are normally waypoints, sometimes associated with radio beacons of their own, along which a route can be flown even without external references (such as in instrument meteorological conditions, IMC). 757toga's answer to this question shows what such a navigation system for long-distance flight can look like. GPS does make it easier to fly the most efficient route possible under current conditions, but it is hardly required in order to fly some route from one airport to another. Being prepared to fly without GPS might, in the simplest of cases, simply mean that you plan for a slightly less direct route and treat your non-GPS navigational aid equipment as required, possibly even primary, rather than secondary or nice to have, since you know there's a clear risk of losing GPS through no fault of your own or of the onboard equipment. 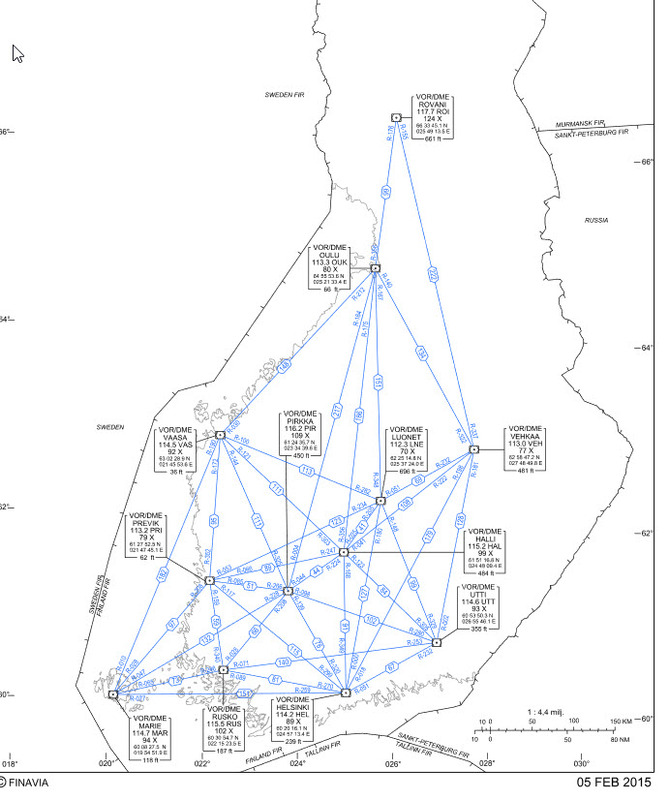 Below is a map of various airways in Finland that extend from VORs (including VOR/DMEs), which are ground based (non-GPS) navigation facilities. It's likely that all aircraft currently navigating primarily using GPS also have 1 or 2 onboard VOR receivers. Long before the development and widespread use of GPS, these route structures were the primary source of (non-visual) navigation for aircraft operating throughout the country. Additionally, aircraft are not constrained to using these straight-line airways between the VORs. Each VOR generates 360 courses (known as 'radials') that permit different routes not depicted on the chart below. Importantly, many aircraft have multi-sensor navigation components that allow "Area Navigation" (RNAV) without using GPS. With RNAV (non-GPS), aircraft can fly direct point to point, similar to using GPS. Lastly, the lack of GPS for navigation would be disruptive to varying degrees, especially for operations that are beyond the service volume range of VORs. But, not that many years ago before the widespread use of GPS, day to day navigation operations were conducted efficiently using the VOR system as well as other non-GPS electronic navigation aids. Other countries have a similar (Non-GPS) route structure as well. Not the answer you're looking for? Browse other questions tagged navigation flight-instruments emergency-procedures gps gnss-gps or ask your own question. What will happen if satellite navigation fails? Is a “GPS required” ILS (or other navaid-based) approach considered a “GPS approach” for alternate planning's sake when TSO-C129/196 gear is in use? How can I check that the GPS receiver is sending data to the transponder? How do hot air balloons navigate? What did Fiji have to do when it incorporated GPS into its aviation system?